Can your gas distribution tapping machine do all this Gas-Free*? System-One live mains entry system meets stringent Gas-Free* standards, and handles any maintenance operation requiring up to a 2½" tapping. ¾" to 2½" live entry in an extremely compact lightweight package. Operates on mains up to 60 psig. A realistic alternative to working "open hole." 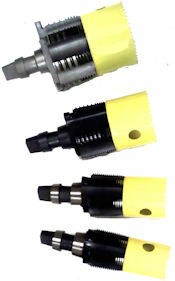 Interchangeable components cover multiple applications. Operates on cast iron and steel and under development for PE. Handles operations ranging from camera entry to under pressure street tee replacement and live internal bell joint repair. No expensive control fittings to purchase or leak. Total safety with sensible economics. Driven by the need to protect the environment and the ever present requirement to improve safety standards in the industry, ALH offers an effective new technology already adopted by many US Gas Utilities. System-One is designed for the relatively low pressures used in gas distribution. The equipment is compact and light, the procedures simple and the economics viable. Gas-Free* operations at both Low and Medium Pressure are now a reality, without exposure to the risks associated with open hole work. Today, much low and some medium pressure distribution maintenance is still carried out while gas escapes from open holes cut in the pipe. This practice contradicts worldwide trends where increasing the levels of safety and environmental concerns have become important Issues. Acceptance of the status quo is the result of deep-set traditions, created before there was a viable alternative. The ¾" to 2½" Drill Head performs all the functions of a conventional drilling and tapping machine while preventing the uncontrolled escape of gas at all times. 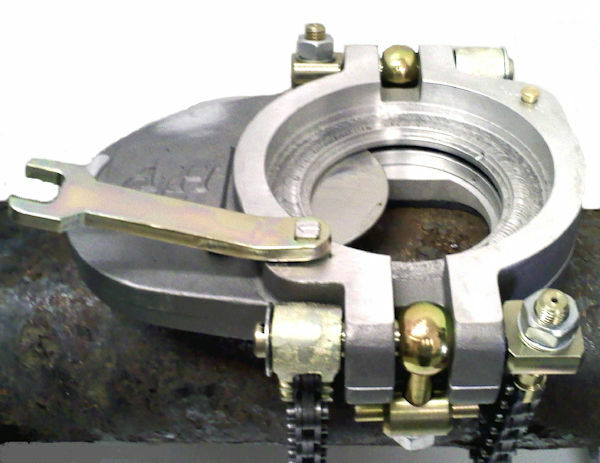 Two large diameter internal drive bearings ensure unequalled accuracy of tapping for leak free threads. The Drill Head locks into a recess on the Control Valve ensuring automatic alignment. In the raised position, the drill shaft is held in an internal Locksquare to prevent accidental damage to the gate. High speed precision holesaws and Skip-tooth taps load together for time saving and accuracy. Specially designed ALH taps ensure a high quality thread pattern. Stops on the tap head automatically ensures a perfect taper thread is cut without measurement, ensuring a leak free final seal when the plug is installed. Although power equipment is available for drilling, tapping loads are still low enough to manually cut 2½" taper threads. A magnetic coupon retention system is standard eliminating dropping the coupon. The key to a successful mains entry operation is to ensure that the entry tap is true and accurate. 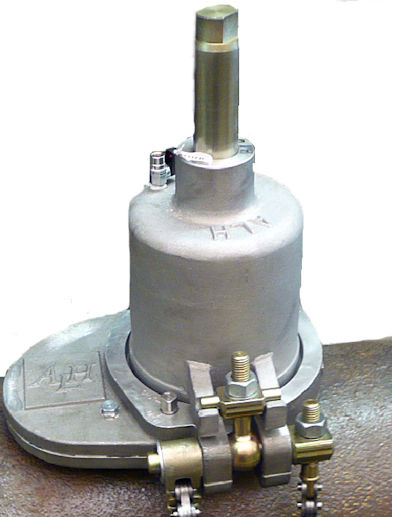 The System-One Drill Head locates into a machined cavity on the upper surface of the ALH Control Valve. 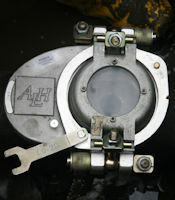 The valve is positioned precisely on the main with individual polymer faced aluminum saddles for each main diameter. The result is a rock steady drilling platform. 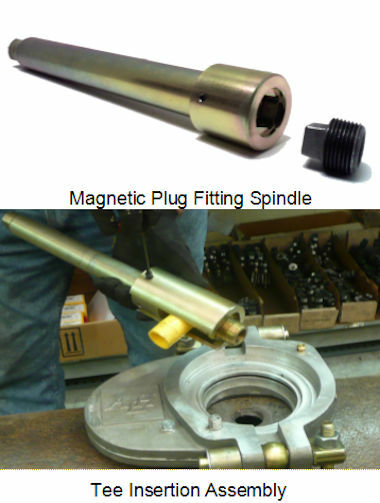 This precision fit allows easy reassembly of the equipment over a fitting for removal or replacement. 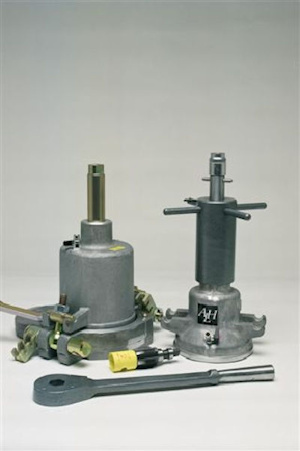 The System-One Control Valve acts as a lightweight, stable platform for all other System-One components. 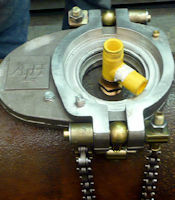 Opening and closing the valve gate during the operation of the system ensures control of the gas at all times. Each additional system component secures onto the valve platform to allow a different maintenance operation. The valve throat is large enough to insert a variety of tees. Low profile construction ensures accuracy in tapping and precise positioning for the most sophisticated maintenance operations. Fits all sizes of cast iron and steel mains up to 48". New applications are continuously being added. 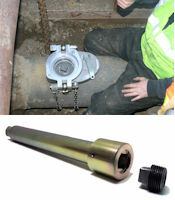 System-One offers the first real advance in 50 years of drill and tapping cast iron and steel. The system combines specially designed high speed Machine Steel Taps with a range of Fine Tolerance Holesaws on a single cutting shaft, that does not require a pilot drill. The combination ensures the minimum amount of metal is cut and the speed of the cut is increased dramatically without compromising accuracy. Holesaws cut cast iron and steel at high speed through to 2½" diameter. High level of accuracy while inexpensive to replace. Designed for hand or powered operations. No power is required for taps on cast iron or steel to 2½" diameter. Skip-tooth design eliminates unreasonable tapping force on larger sizes. Tap follows Holesaw in a single operation. Hand tapping in cast iron always produces a significantly better thread form, but often results in excessive tapping loads. To solve this, the System-One has specially engineered the larger taps with a Skip-tooth design that reduces the load by half yet is capable of producing an extremely high quality thread form by hand. Cheater bars' are never required, even when cutting a 2½" taper with a course 8 threads per inch. Taps are loaded onto the drill shaft behind the holesaw cutter so changeover time is eliminated. 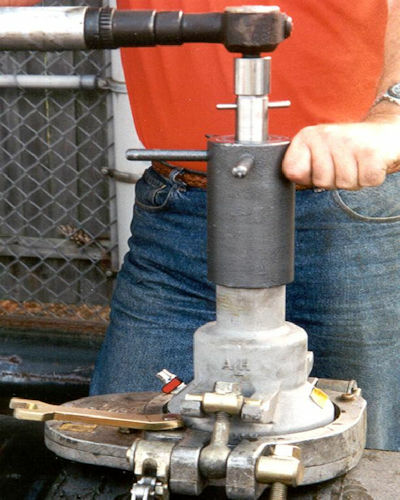 The result is a completed 2½" drill and tap in cast iron in seven minutes or less. 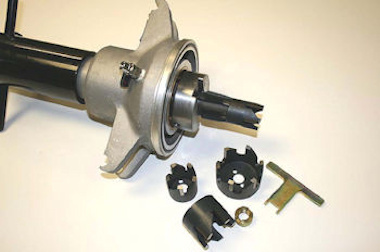 Extremely durable HSS shell cutter designed specifically for cutting steel mains. Less effort and faster than other style cutters. Unique design produces chips not swarf ribbons. Cut and tap in one continuous operation. 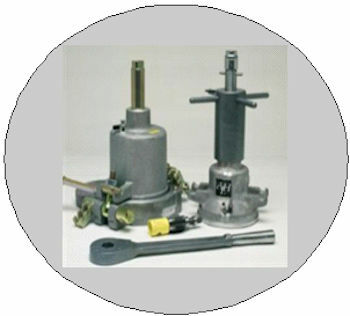 Attaches easily to the ALH System-One with one nut. Always use Kool-Mist as a heat sink. 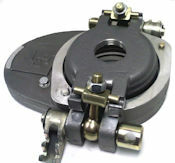 2" 46-A0307 2" System-One Cutter for Steel Mains"
The System-One Fitting Canopy provides a Universal method of inserting a wide range of mains connectors & pipe fittings into cast iron and steel mains at any pressure up to 60 psig without throttling. The Canopy permits a universal method of insertion and removal of fittings and plugs, while maintaining strict control of the gas at all times. 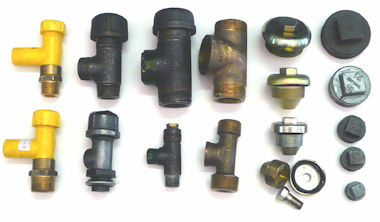 Threaded fittings are placed directly into the main and do not require a full encirclement fitting or any form of saddle. Special PE Tapfree fittings are available to close openings in thin wall steel and cast iron mains without cutting threads. 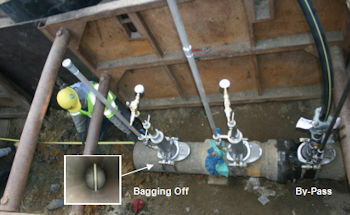 Up to 2 1/2" diameter fittings can be inserted using the System-One. This provides virtually the equivalent to a 3" branch main connection. 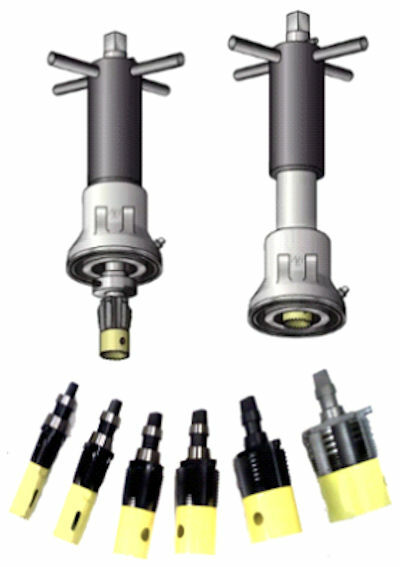 No pressure reduction is required for any insertion application. 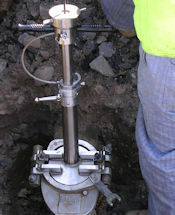 Connections can be made to any diameter cast iron and steel mains. The ALH System-One allows the insertion or removal of up to 2" diameter Street Tees on mains up to 60 psig under Gas-Free* conditions. A full range of tees from 3/4" to 2" can be inserted or removed. Strict tolerances in the manufacture of the machine and a special flexible connector system allow one shot alignment on existing tees for easy removal. 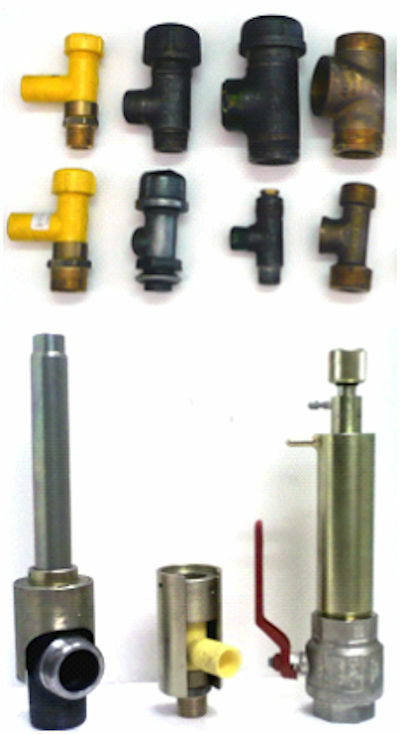 US manufacturers now make a range of street tees in brass and cast steel that can be fitted using the System-One. 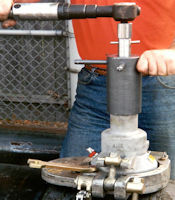 System-One Tee insertion tooling is in use in a number of major US gas distribution companies.